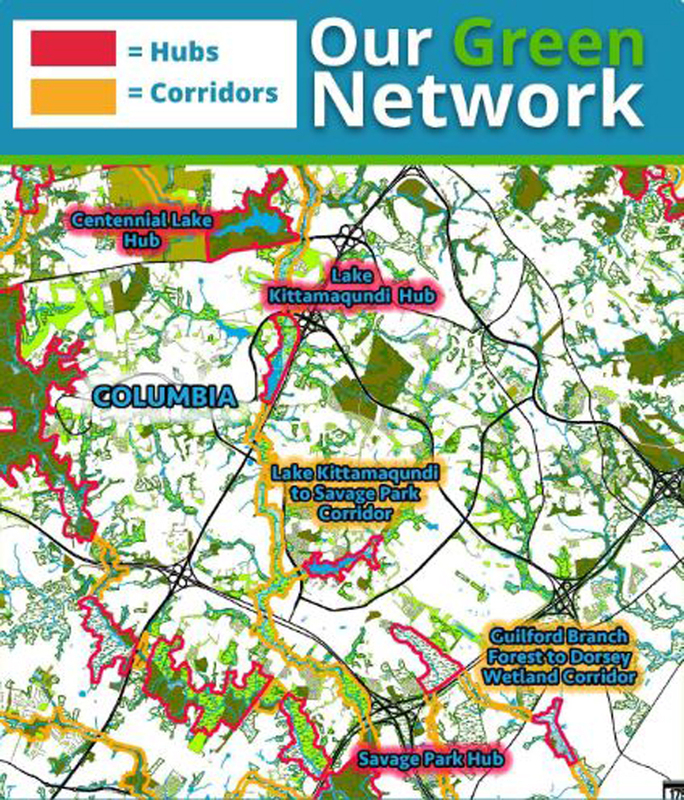 Howard County’s Green Infra­struc­ture Net­work maps the most eco­log­i­cally valu­able forests, wet­lands, mead­ows, water­ways, and other nat­ural areas as well as the lands that con­nect them together. Green Infra­struc­ture helps sup­port native plant and ani­mal species while help­ing human pop­u­la­tions by clean­ing air and water resources, main­tain­ing nat­ural eco­log­i­cal processes, and con­tribut­ing to every­day quality of life. View the Green Infra­struc­ture Inter­ac­tive Map. The ser­vices pro­vided to humans by nature such as flood mit­i­ga­tion, pol­li­na­tion, pest control and beauty, benefit out economy and environment. These nat­ural processes cre­ate ben­e­fits known as Ecosys­tem Ser­vices. Six of these ecosys­tem services are shown below (but many more exist). The basic build­ing blocks of a green infra­struc­ture net­work are hubs and corridors. Hubs are eco­log­i­cally sig­nif­i­cant nat­ural areas that pro­vide habi­tat for plant and ani­mal life. They include large pro­tected areas, such as state and regional parks that are man­aged for nat­ural and recre­ational val­ues; com­mu­nity parks and nat­ural areas where nat­ural fea­tures and eco­log­i­cal processes are pro­tected and/or restored; and private wet­lands and forests that remain in a mostly unde­vel­oped state. Large con­tigu­ous blocks of inte­rior for­est (for­est at least 300 feet from the for­est edge) are an essen­tial com­po­nent of the net­work as they form the majority of our hubs. Cor­ri­dors are the lin­ear fea­tures that tie hubs together and are usually located along rivers and streams. A small sec­tion of the net­work is shown below to give an idea of how hubs and corridors fit together. 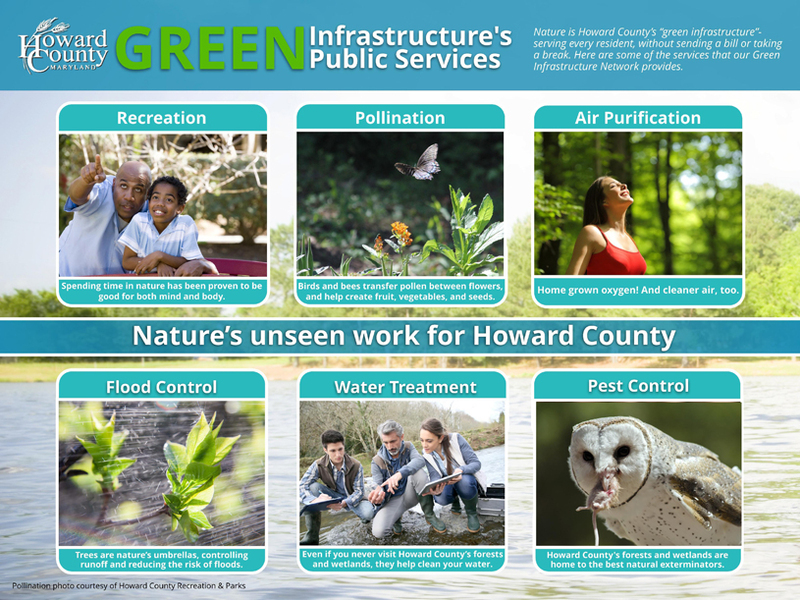 Howard County’s Green Infra­struc­ture Net­work Plan (GI Plan) refines and expands on the State of Maryland’s Green Infra­struc­ture Net­work to include areas of local eco­log­i­cal sig­nif­i­cance. The GI Plan will enable plan­ners to con­sider impor­tant nat­ural resources when prepar­ing the Gen­eral Plan, trans­porta­tion plans, water­shed plans and com­mu­nity plans; mak­ing deci­sions about zon­ing and devel­op­ment pro­pos­als; acquir­ing land for parks and pub­lic facil­i­ties; and obtain­ing agri­cul­tural, envi­ron­men­tal and other land preser­va­tion easements. The Exec­u­tive Sum­mary from the Green Infra­struc­ture Net­work Plan is avail­able here, from the Depart­ment of Plan­ning and Zon­ing web page. Whether you live near the Green Infra­struc­ture Net­work or not you can pro­vide ben­e­fits to the net­work by pro­mot­ing over­all plant and wildlife ben­e­fits. You can work alone in this endeavor or you can work along­side one of many groups focused on improv­ing Howard County’s envi­ron­ment. There are many ways you can ben­e­fit the envi­ron­ment on your own prop­erty. If you’d like to learn about orga­ni­za­tions and vol­un­teer groups you can work with email Bill Mahoney or call 410−313−3833. Please direct ques­tions and com­ments to Susan Over­street, Depart­ment of Plan­ning and Zon­ing, 410−313−4345. Habitat Management Plans (HMPs): The Department of Planning and Zoning is moving forward with implementation priorities defined in the Green Infrastructure Network Plan, including developing habitat management plans for the hubs and corridors. The habitat management plans include information on existing conditions and recommendations for landowners who would like to maintain or improve the habitat on their property. Mary­land Green Infra­struc­ture: The Mary­land Depart­ment of Nat­ural Resources devel­oped a Statewide Green Infrastructure Plan. In this sys­tem, Howard County hubs include the Patux­ent River and Pat­ap­sco State Parks, the Mid­dle Patux­ent Envi­ron­men­tal Area, David Force Park and the Gor­man Nat­ural Resource Area. 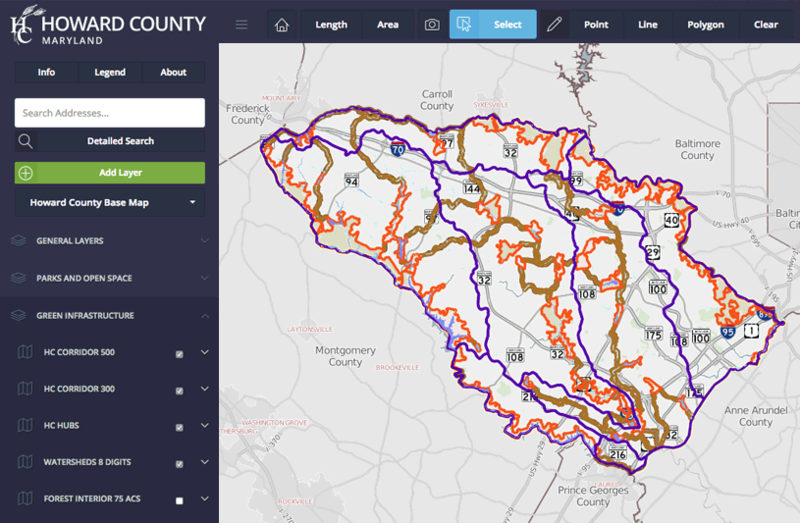 Howard County cor­ri­dors include major stream val­leys and poten­tial over­land con­nect­ing routes.